In our work as educators, we all aspire to be effective. We also aspire to be wise. If teachers are to represent and advocate for education, we must become the stewards of a discourse that nurtures education’s possibilities. This book explores how teacher dispositions are defined, developed, cultivated, and assessed. The authors in the volume consider the various and interconnected ways in which educators’ values, beliefs, attitudes, and behaviors are performed and how these performances affect experiences and practices of learning. This text investigates complex questions, such as: How should teachers be? and Who should decide how teachers should be? In different ways, all the chapters in this book invite us into the work of reinvigorating educational discourse. The contributors contradict the idea that wisdom is the province of the lone genius who possesses knowledge that is obscure to the majority. Instead, they ask us all to participate in the necessarily collaborative endeavor of discourse stewardship in – as grand as it may sound – the pursuit of wisdom. P. L. Thomas: When the Obvious Isn’t True: What’s Really Wrong with Teacher Quality and Teacher Education? Kate E. O’Hara: Urban Teachers and Technology: Critical Reflections in the Age of Accountability. 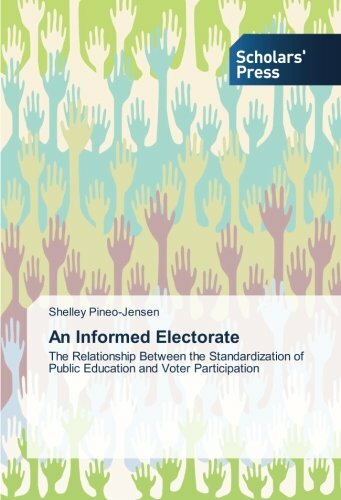 A critical theory lens is used to examine the relationship between states’ educational standardization and voter turnout. The study introduces two new tools: the Standardized Education Index (SEI) measures states’ levels of educational standardization and the Dichotomous Sort of Accountability Concepts frames a critical analysis of educational standards data. No evidence of a positive relationship between higher levels of SEI and higher voter turnout is found. Although the social reality is stark for progressive scholars who engage in scholarly activities or are committed to guiding their students to develop a social-just praxis in the circles of higher education, some scholars have found fissures amid the alienating, often hostile academic world to learn, grow, and create transformative communities. Up to this date, however, their stories have not been captured. Therefore, the purpose of this volume is to highlight alternative narratives generated by transformative scholars who have maintained their oppositional identity to the structures that oppress the vast majority of citizens. By bringing together these narratives, we focus on those who have joined with likeminded colleagues to teach, engage in activism, and conduct emancipatory forms of research, learning to negotiate and survive academic and corporate realities in spite of restrictive climates. Not only are these stories vital for helping students, academics, and the wider community understand how commercialized forces are impacting the professional lives of critical scholars in the academy, they have the power to help current and future critical pedagogues define (and redefine) themselves in a social world which is continually "promoting a narrow and intellectually stifling agenda for the role of education and turning the public against the very idea of a critical education" (McLaren, 2006). As stated by Bruner (1986) stories give "a map of possible roles and possible worlds in which action, thought, and self-definition are possible (or desirable)" (p. 2, cited in Collins & Cooper, 2005). These possibilities for definition and redefinition are what we seek to present, explore and understand. Chapter 1- Breaking the bank: Stories of financial, cultural and academic struggle from firstgeneration college students, Carrie Freie. Chapter 2- Fear in the academy, Tina Wagle. Chapter 3- Dangerous white lady, Shelley Jensen. Chapter 4- College Curriculum as Counter Discourse: The California Immigration Semester at Occidental College, Richard Mora, Mary Christianakis, & Salvador C. Fernández. Chapter 5- A tale of the Teacher Educator and the Storyteller: Returning Stories to the Social Studies Classroom, Sarah A. Robert, Heather Killelea McEntarfer, & Karima Amin. Chapter 6- Our “excellent adventures” with NCATE: Stories of struggle, resistance, and hope, Leigh O’Brien & Sue Novinger. Chapter 7- Autoethnography and the Emergent Public: Counterstories from a Community College Classroom, Jeanne Cameron. Chapter 8- Radical Scholar as Public Intellectual in a Marketplace of Ideas, Paul L. Thomas. Chapter 9- The Skunk in the Yogurt Cup: Postformal Academic Blues as Praxis, Tricia M. Kress. Chapter 10- The Personal is Political: Feminist Resistance to Neoliberalism in the Academy, Alison Happel. Chapter 11- How do I Keep My Ideals and Still Teach? E. Wayne Ross, Rich Gibson, Greg Queen, & Kevin D. Vinson. Chapter 12- "Won’t Back Down:” Counter-narratives of Visibility and Vulnerability in a Bleak House, William M. Reynolds. Chapter 13- Reflecting on insider/outsider critiques of teacher education, or 'don't talk about my momma', Jason Michael Lukasik & Brian D. Schultz. Click HERE to see Dr. P-J's Amazon author page.